Cloudinary is a service that manages an application’s image and video-related needs all in the cloud. It offers a wide range of media management tools used by numerous web and mobile app developers worldwide. True to its name, Cloudinary allows users to effortlessly upload and store images and videos to the cloud. Users also no longer need separate programs to resize, crop, convert, and perform other similar actions as the service offers comprehensive editing capabilities. Cloudinary can also be seamlessly integrated with any web application with its extensive Application Program Interface (API) capacities. Its reliable Content Delivery Networks (CDN) also assures fast delivery of content. Companies can do away with expensive and complex graphics management tools, as Cloudinary presents end-to-end solutions for every organization’s multimedia needs. The solution supports image uploads, manipulations, and optimization for the web, cloud storage, and delivery. It provides APIs and flexible admin features to integrate with existing and new mobile and web applications. Cloudinary allows you to upload and store an unlimited amount of images securely and privately. The storage includes historical revisions and automatic backup. You can manipulate the images utilizing a range of choices such as watermarks, face detection, cropping, resizing, applying effects, and more. Images are served through Akamai’s worldwide CDN for quick and responsive delivery that is optimized for all devices. 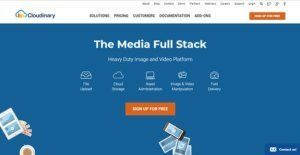 Cloudinary is thus a digital asset management platform with a media library that utilizes SDKs and RESTful APIs to automate image management. Finally, you can use reports and advanced analytics to understand and optimize images performance. Cloudinary streamlines a client’s media management pipeline. This is with the help of the service’s wide array of easy-to-use editing tools. Static and dynamic images are automatically sent to the cloud via its dependable CDN and storage engines. The solution’s state-of-the-art cloud technology ensures that resources are backed up, organized, and can be easily retrieved anytime. Services can scale when there is significant traffic and resource management demands. Because of these, Cloudinary goes as far as to guarantee its clients noticeable improvements in user experience and in an application’s overall performance. Cloudinary also lets application owners concentrate on how to grow their core business more rapidly. This is due to how the service significantly cuts down on time and resources needed to handle issues commonly encountered by developers related to management, storage and distribution of media content. Companies can also save IT-related expenses by up to 90% with the help of this software. This is because requirements related to graphics normally eat up a lot of bandwidth. If one is still not using modern media programs, time that could be spent on other deliverables can be wasted doing extremely tedious multimedia tasks. However, Cloudinary’s comprehensive image and video tools can notably reduce these factors. Cloudinary’s key features include support for private images, image transformation on upload, direct uploading from browser, remote upload from public URLs, version management, and secure upload API. You can easily execute image transformations such as automatic rotation based on EXIF data or aspect-ratio, arbitrary image rotation, image borders, image flipping, opacity manipulation, rounded corners, and format conversion. Make use of image effects and filters such as fill light, vibrance, color channels, sharpen, tilt shift, improve, blur, gradient fade, pixelate and vignette, oil paint, hue, saturation, contrast, brightness, sepia, black & white, grayscale, and more. Cloudinary supports a range of image formats including JPG, WebP, SVG, PSD, EPS, PDF, ICO, TIFF, BMP, GIF, and PNG. Other key features are video thumbnail extraction, social network profile picture extraction, animated GIFs, merge multiple images, and PDF to image conversion. Cloudinary also offers automatic stripping of image metadata, dynamic JPG quality control, and automatic image optimization like WebP delivery on compatible browsers. The platform integrates smoothly with your development framework supporting iOS, Android, Scala, Java, jQuery, Python & Django, .Net, Angular, Node.js, PHP, Ruby on Rails, and more. Further, integrations with a wide variety of systems including CMS, PIM, eCommerce, project management and existing DAM solutions makes Cloudinary a flexible solution that fits in your existing workflow. A powerful API and integrations with popular development frameworks makes it possible for developers to integrate media management into your web and mobile apps or into your custom workflows. When you upload an image and apply transformations, you use your server’s processor for the tasks. Cloudinary frees your server from these tasks and allows it to focus on its main work which is serving web pages quickly to your website visitors. Finally, by serving images from this platform’s CDN, you can speed up your site and free it from bandwidth-consuming image resources. This is especially important if your website is hosted on limited shared servers. Cloudinary is built to accelerate time to market for teams that care about images and video – marketers, creative directors, media managers, and, web and app developers. With Cloudinary’s cloud service, you can maximize the value of your digital assets, automate image and video workflow, and, deliver engaging visual experiences that are optimized for performance across multiple delivery channels and user preferences . Cloudinary’s dynamic DAM lets you visually organize folders and share them securely with your teams using role-based permissions. As assets are uploaded directly or fetched from a URL to Cloudinary’s elastic cloud storage, they can be tagged individually or automatically categorized with machine learning. AI based face and celebrity detection and OCR and video transcription make your assets more valuable. Powerful AI-powered search makes it a breeze to find the right asset based on tags, context, format, size, style, colors, faces, or location. Powerful analytics give you insights into usage and asset performance. Images and video need seemingly endless variants of size, crops, formats, and effects to meet creative design requirements, responsive needs, and optimized delivery to every screen. Unlike legacy solutions, Cloudinary automates creation of asset variants – crop, scale, transcode, enhance and optimize either at upload or dynamically on-the-fly with end-user personalization. An easy-to-use UI allows non-technical users to create sophisticated marketing campaigns with image and video manipulation and effects, freeing up creative and developer talent to concentrate on creating new assets and core business needs. Unlike traditional DAM solutions, Cloudinary is built to serve as an end-to-end media platform for companies who believe images and video are not simply assets to manage, but are critical to customer experience and conversions on your web and mobile apps. Cloudinary’s cloud platform enables custom content for personalized delivery, and the ability to dynamically deliver content that’s optimized for fast loading, increasing conversion rates and revenue. Hundreds of thousands of users at the hottest startups and enterprises trust Cloudinary’s proven platform for their media management needs. Customers such as Bleacher Report, Buzzfeed, lululemon athletica, Financial Times, Flipkart, Forbes, Neiman Marcus, Stitch Fix, Taboola, Under Armour, Whole Foods, Wired, and many of the most iconic brands across all verticals, use Cloudinary. What Problems Will Cloudinary Solve? Problem #1: You often find yourself behind deadline when it’s time to market. It’s time to publish a new article. Julie, the editor, needs a cover image for visual storytelling. She could either request the designer to create one or ask her team if they recall something similar from before. Given that her team is globally distributed, it could take a while to hear back from everyone. Either way, Julie can’t publish the article right away. With Cloudinary, they can access all the images and videos created for past campaigns in Cloudinary’s digital asset library. Cloudinary automatically tags all assets according to their content – Julie can simply search and browse the media library with tags and attributes, including content, type, resolution, and format. This enables her to instantly find a suitable asset and publish the content—on time. John, the e-commerce store manager at a popular shoe company, needs to add a new product to the online storefront—display it on the company website and on Android and iOS apps, and also promote it on social media. That task could be cumbersome, calling for different product shots for the product gallery and multiple variants of those images that fit the resolution and layout of various devices and channels. Having read articles on how page load-time affects conversion rate and revenue, John understands the importance of optimizing images for fast loading. To optimize images, however, his team would have to create different versions with optimal formats and quality for a whole array of browsers and devices, which might also require technical expertise or support from the development team. With Cloudinary, he can upload just one high-resolution version of the product shot and automatically deliver it in the most optimal resolution, quality, and format based on the content and viewing context. Through an intuitive interface, John can also manipulate, enhance, and optimize images and videos in real time by applying simple transformation parameters. It’s time to replace the company’s website banner for a launch. The marketing team uses their storage, which includes a combination of their computers, Google Drive, and Dropbox. When the new banner is approved, they label it *final* and share it via Dropbox so that the development team can embed it on the home page. While the final version is sitting in the developer’s inbox, someone made last-minute updates to the image and shared the new version, labeled as final_final, with the web developer via email, who then published the image on the website. In the meanwhile, the social media manager tweets the final—(but now out-of-date)—version from Dropbox. Such a left-hand-not-knowing-what-the-right-hand-is-doing scenario is all too common, causing internal confusion and suboptimal campaigns. Cloudinary’s powerful media library acts as the single source of truth, complete with version control. The entire organization can access the latest version of all the digital assets and edit them any time, worry free. If you are considering Cloudinary it might also be beneficial to analyze other subcategories of Best Digital Asset Management Software gathered in our base of B2B software reviews. Every business is different, and can need a particular type of Digital Asset Management Software solution that will be adjusted to their company size, type of customers and staff and even individual industry they cater to. You should not count on getting a perfect app that will be suitable for each business no matter what their background is. It may be a good idea to read a few Cloudinary reviews first and even then you should keep in mind what the software is supposed to do for your business and your workers. Do you need an easy and intuitive app with just basic features? Will you really use the advanced tools needed by experts and large enterprises? Are there any particular tools that are especially beneficial for the industry you operate in? If you ask yourself these questions it is going to be much easier to locate a reliable app that will match your budget. * Note: One second of video manipulation is counted as two monthly transformations. Video and image management at any scale with dedicated support, enhanced security, and custom configurations. We realize that when you make a decision to buy Digital Asset Management Software it’s important not only to see how experts evaluate it in their reviews, but also to find out if the real people and companies that buy it are actually satisfied with the product. That’s why we’ve created our behavior-based Customer Satisfaction Algorithm™ that gathers customer reviews, comments and Cloudinary reviews across a wide range of social media sites. The data is then presented in an easy to digest form showing how many people had positive and negative experience with Cloudinary. With that information at hand you should be equipped to make an informed buying decision that you won’t regret. What are Cloudinary pricing details? What integrations are available for Cloudinary? Integration with Cloudinary is hassle-free with its comprehensive pool of open source client libraries such as Android, iOS, Microsoft.net, Scala, Java, Angular, JQuery, Django, Node, Php, and Rails. Users can also integrate with Platform as a Service (PaaS) providers through a single click. Partners include Windows Azure, AppHarbor, Engine Yard, and Heroku. Cloudinary can be integrated seamlessly with CMS Solutions, Workflow Solutions, PIMs, eCommerce frameworks, and many popular development frameworks. A wide variety of systems including CMS, PIM, eCommerce, project management and existing DAM solutions makes Cloudinary a flexible solution that fits in your existing workflow. A powerful API and integrations with popular development frameworks makes it possible for developers to integrate media management into your web and mobile apps or into your custom workflows. If you need more information about Cloudinary or you simply have a question let us know what you need and we’ll forward your request directly to the vendor.